Welcome to visit the LH Lift stand at Agritechnica in Hannover, Germany, from 12 to 18 November. 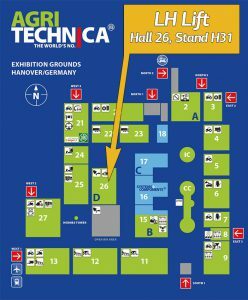 You can find us in Hall 26, Stand H31, where we will be exhibiting together with seven other Finnish agricultural machinery manufacturers. Come and find out more about our wide range of lifting and pulling devices, including our pivoting front linkage, which is available for all tractor models, and our lower link arms with patented ball seat machined directly into the arm.